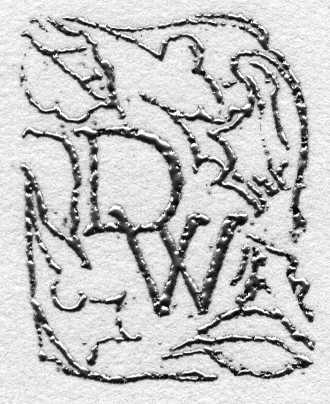 engraving and cut out layer to title page. 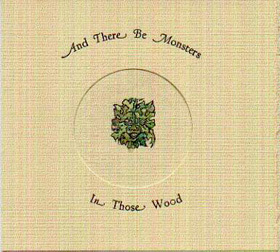 There Be Monsters, short story, wood engraving and a linoleum cut by Chad Pastotnik. Told from the monsters perspective, kind of fun. Hand set in Lutetia with swash characters and printed on Neenah Classic Laid (deluxe) and Classic Laid Writing (reg.) paper. 25 books bound deluxe on straps woven into Iowa PC4 paper and 150 books pamphlet bound into Gray Flax Canal paper. Hand colored wood engraving and linoleum cut, 10 pgs. 5 1/4 x 5 inches. $50.00 and $35.00 Numbered and signed deluxe only. Shown above is the center spread from the book featuring the hand coloring of the lino cut.